Opening Reception will feature Mountain School Bookhouse by Shannon Gerard and table by local zine library Junto. 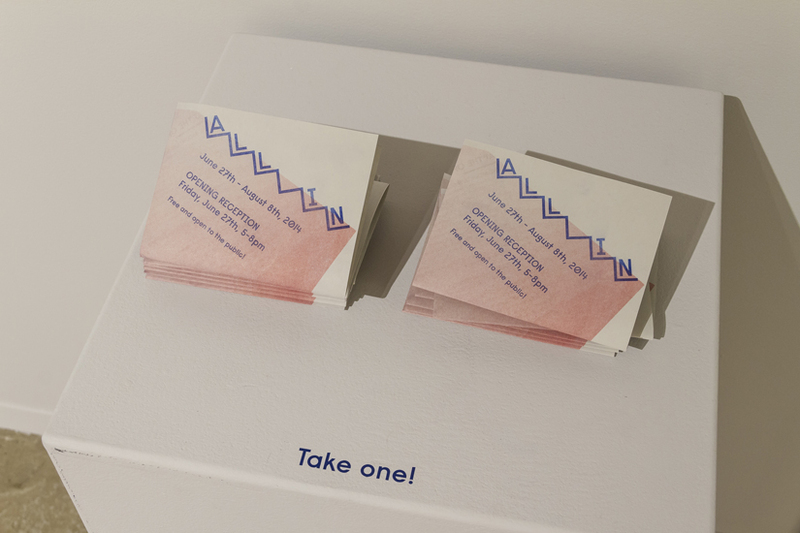 ALL IN is a curated exhibition that seeks to explore the relationship between community and print process. The exhibition brings together a large variety of work by artists and collectives, both local and international. Work ranges in theme and perspective; attempting to show a varied survey of people working with ideas of community, collaboration and communication. The print studio is a place where people of different skill levels, intentions and backgrounds are put together in the same space, different but all connected through artistic process. Printmaking at its core is a democratic medium, allowing for the creation of multiple copies, which in turn allows more people to own or experience an artwork. James Hutchison’s piece Proposal for a Group Discussion sets the tone for the exhibition. A circle of chairs, each from a different perspective invites difference and communication. Originally made for “imagined participants in an imagined discussion group” the work attempts to bridge a gap between the individual and the group experience. The Glasgow based artist collective Poster Club is an example of artists working with ideas of collaboration. Made up of eight artists, all with their own individual art practices, the collective meets weekly to collaborate on various print based projects. In their words, “Using the poster format and screen print as open-ended starting points for their projects, Poster Club’s primary interest is in using the medium of print as a site for experimental collaborative practice”. Many of the other collectives such as Winnipeg based PAC (Pinhole Arts Collective) take a different approach. All are linked through the medium of Pinhole photography but their collective is about making individual work together through regular outings and group meetings. Their work is about Individual creation within a group framework. This process of creating multiple copies through print process lends itself to creation of objects such as zines, posters and other paper ephemera. Many of the zines and book works features in the exhibition are connected to printmaking through the idea of dissemination. Pre- Internet, the zine movement of the 1990’s was about rebelling against mainstream culture. It was about creating your own platform to share information. Print processes such as photocopying and screen printing allowed for a cheap mode of dissemination. The movement was less concerned about aesthetics and more about sharing, empowerment and education, bringing the personal public and the public personal. Inspired by this Do It Yourself (DIY) movement, many of the zines in the show connect with community through themes of educational empowerment offering alternative ideas, recipes and instruction for different modes of living and working. Using print to disseminate ideas and give a public voice to people not normally visible in mainstream media or in control of how they communicate to larger audiences. The purpose of this exhibition is to examine a small slice of larger cultural movements, away from autonomous art made by and for individuals, towards processes of participation and collaboration. Many of the collaborative projects, though started as fun activities to do while hanging out with friends also question ideas of how art is made and experienced. ‘All In’ is defined as involving everyone and everything. As curators we are interested in the negotiations, discussions and ideas that come through this inclusion. We are less interested in specific ideas of social practice and more in questioning how we create, experience and value artwork both as artist and viewers. 1234V is an independent literary publication that shared incidental and anecdotal stories about vaginas from 2007-2010. Also known as a “vajournal” it was founded by Jo Snyder and Sarah Michaelson, publishing witty, crass and smart writing and visual art by women, men, trans, straight, and queer folks from across Canada. KIMIWAN is a quarterly publication that showcases words and art from emerging and established Indigenous, First Nations, Métis, and Inuit writers and artists. Based in Saskatoon, Saskatchewan, Treaty Six Territory, kimiwan means rain in nehiyawewin (Plains Cree). SAPPHO ZINE is a non-profit collective consisting of an ever-changing number of Winnipeg women and local contributors. Named after the first published female, Sappho Zine strives to inspire and empower the individual through the collaborative art of zine making; to encourage the building of strong community through creativity, expression, and independent literature; and to empower the feminist spirit while expressing love and support to all. TRANS.ZINE! is a Manitoba based DIY zine shared throughout the world from 2005-2009. Containing a variety of written and visual mediums that feature insights on/about individuals with trans/genderqueer/gender diverse experiences, their families, friends, partners, allies, and sidekicks, trans.zine! seeks to be forum for creativity, expression, celebration, information, and education. DUTCH ELM DISTRO seeks to support community building by sharing the zines and art. Collected zines and art are compiled into fun packages then distributed through Wolseley, West Broadway and the West End. By collecting contributions and using person powered transport, Dutch Elm Distro aims to use creativity and physical travel to draw lines of connection between artists, neighbours, and residents. Dutch Elm Distro is a non-profit collective that donates proceeds above costs to local community organizations. JAMES N HUTCHINSON's work represents a promise that remains unfulfilled. It was made as a set of gifts for imagined participants in an imagined discussion group. The group was never assembled and the gifts were never given. During their production the pictures functioned as a meeting place in themselves, a reason to be in the same room as another person, discussing potentiality, the aesthetics of productivity, and what an object is ultimately capable of. When the pictures were complete, they already felt exhausted so were never asked to perform the role intended for them. Now here they are, hanging on the wall of a gallery amongst other points of discussion, like the skeleton of shelved, unfinished building surrounded by gleaming skyscrapers following a real estate crash. PAC (PINHOLE ARTIST COLLECTIVE) is a community of likeminded individuals creating art. At times nomadic, PAC embraces playful artistic practices, often but not always, using pinhole processes. These bookworks reflect PAC at a moment in time; a year of daytrips spent exploring the collective and the singular. Participating Members: Sarah Crawley, William Eakin, lori fontaine, Jen Loewen, and Merrell-Ann Phare. 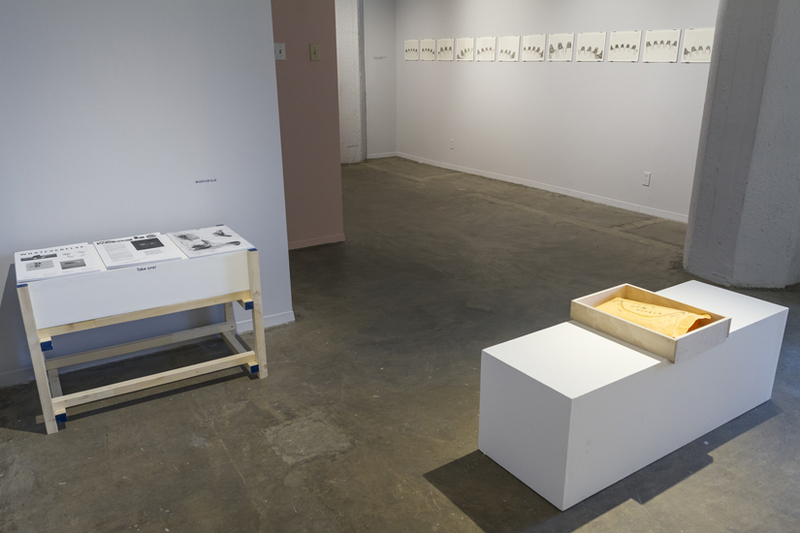 PLACES FOR PEANUTS is a Winnipeg based drawing collective that first met in 2011, as five like-minded artists eager to connect and socialize through the communal creation of art. The group grew to a fluctuating cast of over 50 members, meeting weekly to engage in drawing games and share ideas. Since the release of four zines and four large group exhibitions Places for Peanuts has focused on their main intention – creating a welcoming and inclusive environment to make and share art - through hosting much larger interactive drawing parties at local bars, galleries and coffee shops. POSTER CLUB is a group of artists based in Glasgow who collaborate on designing and printing posters and installations. Using the poster format as an open-ended starting point for their projects, Poster Club's primary interest is in using the medium of print as a site for experimental collaborative practice. Poster Club's recent exhibitions and projects include: Impact 8, Dundee Contemporary Arts (2013); Ski & Save, the duchy, Glasgow (2013); Outskirts Festivalat Platform, Easterhouse, Glasgow (2013); Poster Club, Eastside Projects, Birmingham (2011) and Le Poster Chaud, Glasgow Print Studio (2011). WHATEVER ELSE is a series of three broadsheets, co-published by Intercopy Multiples and As We Try & Sleep Press, that were quietly distributed throughout Winnipeg and beyond in 2011 and 2012. The publishers invited a different artist/curator/poet to imagine a broadsheet. hannah_g, Katherena Vermette, and Andrea Roberts contributed their interpretations of the format.